A hopper is used to hold bulk materials before they are transferred into a conveying system, bag, or container for use or for distribution. The hopper is designed to temporarily store bulk materials until they need to be emptied out into something else through a discharge port on the bottom. When the port is opened, the contents pass through the hopper in a controlled flow to the next part of the handling process. Hoppers are typically manufactured using sheets of steel, due to its durability and the ease of manufacturing. The steel is generally formed into a conical or wedge-like shape to facilitate the movement of materials toward the outlet at the bottom of the hopper. At the outlet port, the hopper can be fitted with a variety of different components, depending on the requirements of a particular application. Some simply have a sealable port which can be opened to quickly dispense large quantities of materials. 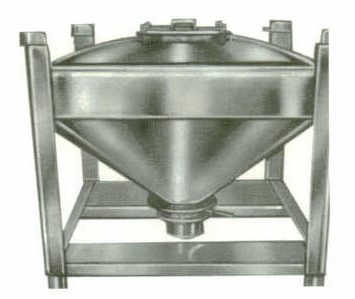 Stainless Steel Hopper and Bin – G & F Manufacturing Company, Inc.
Other hoppers may be equipped with valves for more controlled distribution of the contents. For example, hoppers used to feed materials into pneumatic conveying systems commonly use rotary valves to gradually feed materials into the conveying stream. Still other hoppers may use an auger to discharge material. These containment products are incredibly important in many different bulk material handling processes because they provide a means for controlling the dispensing of bulk products. For weighing and batching applications, they can be outfitted with sensors to track how much material they contain which is incredibly important for ensuring that a particular batch has the right blend of ingredients and the appropriate quantity of each ingredient. 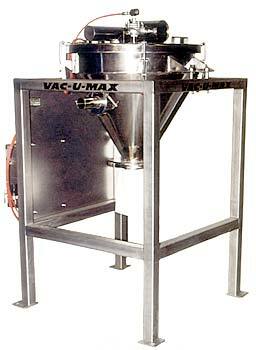 They also provide flow control for conveying systems. With the appropriate components, a hopper can help keep conveyors from being overloaded, which can lead to a variety of problematic consequences. In fact, these products are so vital to bulk material handling that they are often built into or integrated into other bulk material handling products as standard. All in all, when it comes to bulk material handling applications, hoppers are a crucial component for material flow and control. Hoppers A hopper is used to hold bulk materials before they are transferred into a conveying system, bag, or container for use or for distribution. The hopper is designed to temporarily store bulk materials until they need to be emptied out into something else through a discharge port on the bottom. When the port is opened, the contents pass through the hopper in a controlled flow to the next part of the handling process.